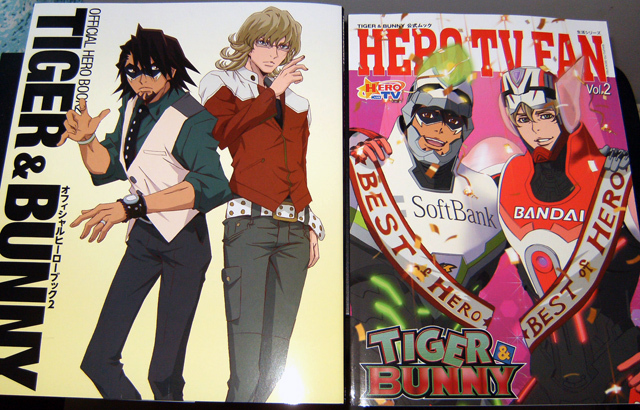 The official Tiger & Bunny Twitter announced that KING OF WORKS archive has been delayed, new release date is June 29th. Due to the change, preorder deadline has been extended to April 25th. The reason of the delay is that they are adding more content and increasing the quality. Instead of three books, there’ll be four, and the total page count has gone up from 400 to 800. They are also adding some new illustrations to go with the archive. The special calendar that comes with it has been changed to start from September 2012 and run to August 2013. The price of KING OF WORKS remains the same. I had been fretting over not being able to order Katsura’s Limited Edition artbook, but now I don’t mind because KING OF WORKS sounds more interesting. If you’re balking at the price, it’s not actually that bad when you consider it covers a set of three books. There are over 400 pages Correction: Release date was changed to June, and page count increased to 800 in four volumes. The archive consists of character designs, setting materials, original scripts, and more. It also comes with a calendar as a bonus item. CDJapan helpfully lists item weights, and KING OF WORKS is listed at 1950g (almost 2 kilos or 4 pounds) so shipping fee will not be cheap. I’ll update more links and information to this post as I find them. I confess, I am really bad at keeping up with ongoing manga series, and I prefer to read tankobons or completed series. 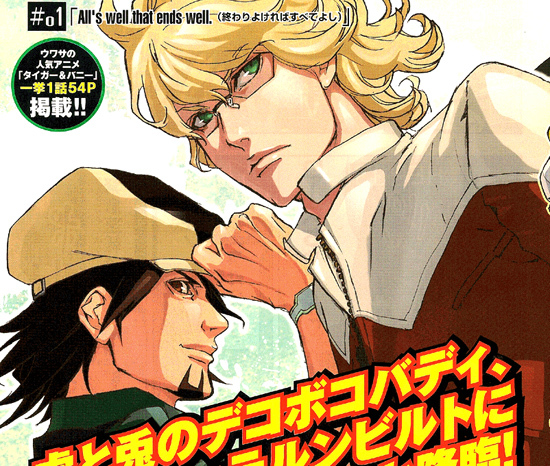 That’s why I’ve been putting this off until the first arc completed in Newtype Ace‘s serialization of Tiger & Bunny by Sakakibara Mizuki. Art wise, I’ve got mixed feelings. There’s something about Sakakibara’s style that I don’t like. At first I thought that maybe I was just too partial to Katsura’s style, but then Aki and I came to the conclusion it’s probably the way Sakakibara draws the characters’ eyes. The hero suits look great and there’s a lot of attention to detail, but somehow the characters themselves feel less expressive. Body language is utilized just as in the anime, the eyebrows and mouths aren’t expressionless but somehow the eyes just don’t look lively and it leaves a cold impression on me. When adapting a story from one medium to another, you can’t always bring it over just as it is because what works in manga may not work as well in anime format, and vice versa. Change too many things – or the wrong thing – and fans will complain. In my opinion Sakakibara is doing well with this adaptation, the story is following anime very closely but the change in point of view from Kotetsu to Barnaby makes adding new scenes easier and helps to keep it from feeling like it’s all “been there, seen that”. As a protagonist Kotetsu was easier for the audience to approach, and even in the anime I was first put off by Barnaby’s character and it took a long time before I started really liking him. 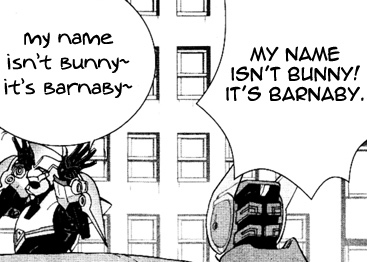 I also think that telling the story from Barnaby’s point of view wouldn’t have had the right impact in the anime, telling it from primarily from Kotetsu’s side helped to keep the mysteries longer. I haven’t seen any dates yet for tankobon release, the chapters are pretty long and released monthly so there should be enough for a full volume soon. There’s also the bi-monthly serialization in Miracle Jump by Yoshida Erika (story) and Ueda Hiroshi (art), more about that later when I have more than just one chapter to read! I like recurring villains in a superhero setting. They make things more interesting, and give the superheroes something to fight on an even ground. 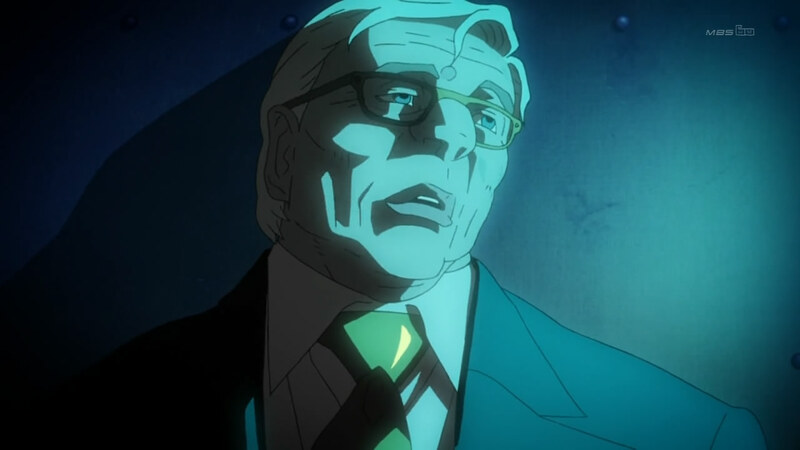 However, I’m not really sure if we’d want this particular guy as a recurring villain. He was a bad villain to start with, and I know only a couple of people who actually like him. Lunatic torched him so thoroughly nothing was left. Lunatic did the cover-up and took Maverick for questioning (no immediate torching took place – though this deviates from what we see in the final episode). He pretended he lobotomized himself and somehow survived and escaped. Option number one seems somewhat possible. Option number three is very unlikely, Lunatic sets things on fire first and doesn’t bother to ask questions – but Maverick was involved in all the faking going on in Hero TV and in what happened to Mr. Legend. Option number four is too far out, but when dealing with trolls it’s best to list all possibilities. 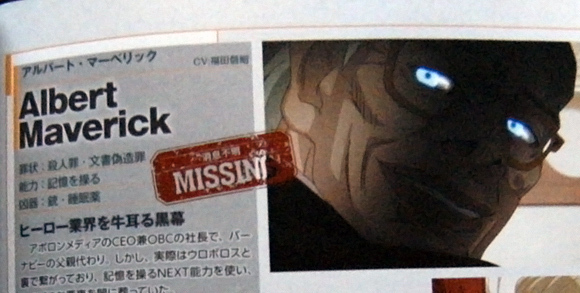 We’d be willing to bet our buyfagging money on the second option and Ouroboros involvement in this, even though a quick check with Official Hero Book 2 doesn’t mention Maverick being missing, it just talks about him being “judged” by Lunatic (this clearly involves torching). If we stick to the cover-up option, it would be easy since the press of Sternbild doesn’t seem very inquisitive. 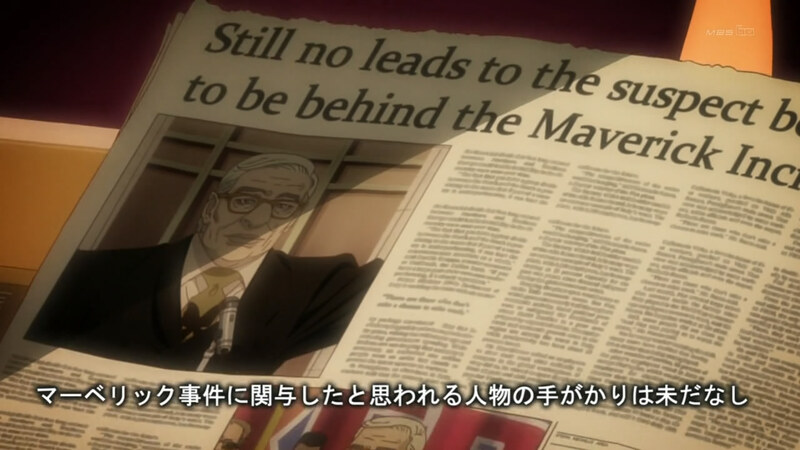 This could just be that the majority of the press is a part of Apollon Media – in other words under Maverick’s control. The big companies seem to direct the entire city, so for example the smaller newspapers might not survive for long before getting driven out of business or getting bought out by Apollon Media. So if Ouroboros covered it all up, why did they do it? It was confirmed that the “certain organization” Maverick worked with was Ouroboros, and he obviously knew a lot about what was going on behind the scenes. By this point he was already a self-inflicted vegetable so he couldn’t talk and reveal their secrets – unless there was a possibility of somehow getting the memories out of his jumbled brain. Was it just a precaution to keep everything hushed and in secrecy? Maybe it’s standard Ouroboros policy to cover up every incident that might affect them? Maverick was one of the most powerful men – if not even the most powerful man – in Sternbild, and he was clearly afraid of Ouroboros and what they would do when the truth of what he’d been doing was revealed. We don’t think it’d be worth bringing Maverick back as a character in any of the continuations. Definitely not if the intention for bringing him back would be redeeming him. He didn’t show remorse for any of his deeds before he “maveried” himself. 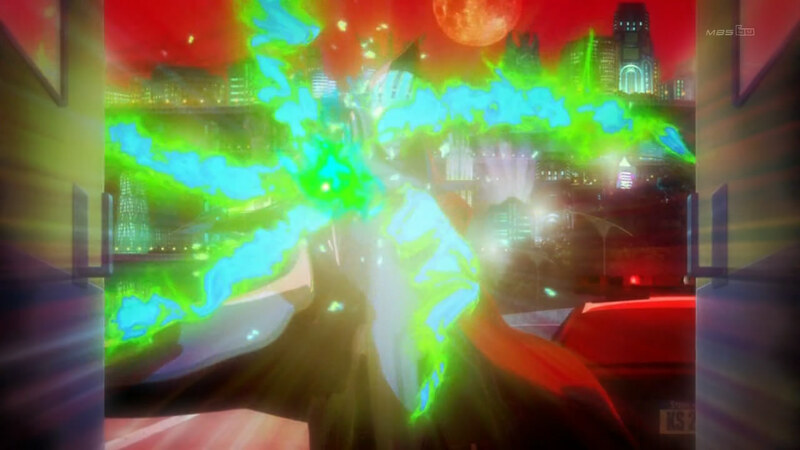 (The Japanese fans turned the memory alteration into a verb, 「マベる」 maberu. I remember even seeing the staff&cast use it in interviews.) Redeeming someone who doesn’t see the error of his ways is pointless, and although Nishida says that Maverick wasn’t a completely wicked man we think he’s a smarter writer than that. It’s possible that whatever happened to him will be referenced or mentioned if the Ouroboros storyline continues, since it’s such an integral part of the setting. There’s just too little information of Ouroboros to make bigger predictions or deeper speculah, so we’d love to learn more about it in the movies or even in one of the manga serializations. Right now Ouroboros speculah is kinda boring since we have already talked about every option so many times. Hey, still feels Goodman to speculate a little bit for a change. Official Hero Book 2 and Hero TV Fan vol. 2 are finally out. As I expected, the three week delay was so they could include advertisements for NEXT Project part 2 – in other words the movies – with the books. These books cover the 2nd cour (episodes 14-25) and they pick up from where the first set of books ended. Layout and style-wise they’re similar to them, so if you got those you know what to expect.